Observed in the North Maricopa Mts., Maricopa Co., Arizona, USA. 13 February 2005. 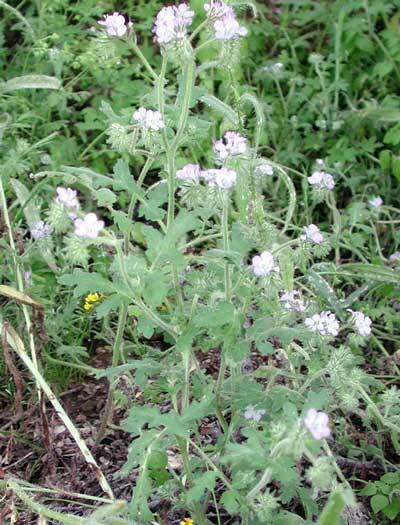 FLOWERS: Five pale blue petals occasionally darker violet or very pale, almost white. Blooming Feb. to April depending on available moisture. LEAVES: Soft, minutely glandular, alternate leaves once or twice pinnately divided. SEEDS: Each spherical capsule has a couple of seeds. Under 10x magnification seeds appear pitted. RANGE: Rocky slopes, wash banks and even on flats in wet years. Fairly common across the Sonoran Desert, sometimes abundant. Ranges west into the Mojave Desert. Absent in drought years. ANNUAL: An upright spring annual rarely exceding 50 cm.